Providing top quality children's entertainment in the Cheshire, Chester, Stockport, Manchester and around the Northwest. Fast paced, fun filled, action packed 2 hour party formula. The party entertainment is perfectly suited for 4 - 8 year olds. The birthday star is the superstar of the day guaranteeing the party of a lifetime for your child. 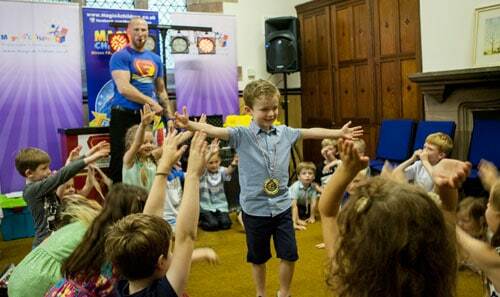 Olly “G” delivers 2 hours of end-to-end fun and engaging kids entertainment specially formulated to keep 4 - 8 year olds totally gripped for the whole duration of your party. See More about Olly "G"
Entertainment flows from beginning to end with a jam-packed 2 hour birthday party fun show designed to keep your 4 - 6 year birthday party guests engaged. Enjoy a stress free party whilst Doodle entertains the children for the whole party. 2 hr non-stop, high energy and ultimately engaging party formula specifically aimed at 4-6 year olds. Your child will have the best party ever as Bubble keeps the focus on them right throughout their party. The party was fabulous! We were so pleased with everything that you did. The children were constantly engaged and we could hear their laughter all the time! Thanks so much for all your hard work. It is much appreciated and you really helped to make Isabella's birthday special! Thanks so much for your help organising the party. It was absolutely brilliant - we couldn't have asked for anything more. Felix had a great time from start to finish, as did all the other children (and parents!). I think Freddie might be getting some more party requests from Felix's friends! Not one size fits all and that's why we have dedicated kids entertainment with specialist shows suitable for birthday parties, christenings, schools and playschools, larger events and any occasion where making children feel special is a priority. Magic 4 Children operate from Warrington in Cheshire and entertain children in Warrington, Cheshire, Manchester, Liverpool and around the North West. Amaze and amuse family and friends with specialised children's entertainment packages tailored for christenings to give maximum enjoyment to a mixed aged audience. Magic 4 Children have a choice of school entertainment packages which are suitable for the whole school as well as family evening entertainment programs that are great fundraisers. Christmas is a time of magic and merriment and Magic 4 Children aim to make your seasonal event successful and hassle free. We are specialist children’s entertainers for Christmas parties with a festive fun party package designed to reflects the holiday season and spirit. Magic 4 Children provide reliable and professional children's entertainers in Cheshire, Manchester, Stockport and Merseyside. We provide kids entertainment for birthday parties, christenings, schools and events where the focus is on entertaining children. When you hire a kids birthday entertainer from Magic 4 Children, you have a stress free day secure in the knowledge that the kids are having a ball leaving you free to enjoy the party. Our fun children's entertainment packages include magician shows, interactive games and a fun magic and kids disco show with activities and prizes. 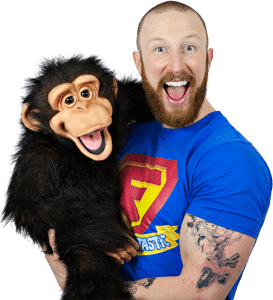 Choose from a selection of entertainers - Freddie Fantastic, Olly G, Doodle and Bubble - with different age appropriate kids entertainment including children’s birthday shows, children’s magician shows, children’s disco, activity parties and full party runner packages. With such a variety of children's entertainment, you can select the best performance to suit the age group and style of your birthday party. It is all about your child having the BEST PARTY EVER! Extremely professional, very well-organised and he really was fantastic! Thank you so much! All the parents and children loved every minute! Stuck for Ideas for a Children’s Christmas Party? Try This!